Issue gets fresh push for action driven by Buckhead crime spike. Earlier this month, Eddie Brantley was arrested driving a car stolen from outside a Midtown dry cleaners. Police were well-acquainted with the Stone Mountain man. They’d previously arrested him 69 times — for armed robbery, burglary, aggravated assault, possession of a firearm by a convicted felon and 19 parole or probation violations. Yet there he was, back on the streets, allegedly committing a brazen crime in a busy part of town. Brantley is no outlier. For years, a problem has festered on the streets of Atlanta; the same people committing the same crimes, over and over again. Brantley is merely a recent poster child for what authorities say is an epidemic in Fulton County of repeat offenders. There is plenty of blame to go around. District Attorney Paul Howard argues Fulton judges are too lenient, creating a revolving door for criminals, a charge echoed by police. Judges blame dysfunction in Howard’s office — too much turnover among prosecutors and unreasonable sentencing demands. They say they often lack important background information about defendants when making decisions on bond and sentencing. Police accountability is another issue. Records obtained by The Atlanta Journal-Constitution also show that APD officers failed to show up 2,340 times last year to testify at a grand jury. But amid all the finger pointing, the issue is getting renewed attention — and a fresh push for action — driven by a well-organized and well-heeled coalition of citizens. At the end of 2018, crime soared in Zone 2, which includes all of Buckhead. In January more crimes were reported in Zone 2 than in any other in the city. As Buckhead residents demanded action city leaders have been forced to respond. That the affluent area has outsized political clout is not lost on top law enforcement officials. 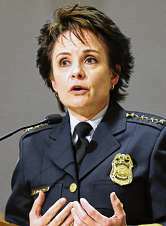 Atlanta Police Chief Erika Shields said the same issues have been plaguing the city since she joined the force as a beat cop in 1995. “What I’ll say is different is the population being victimized. They’re really well-organized, they’re vocal, they’re influential,” she said. 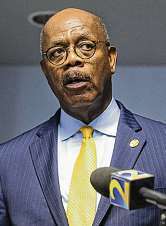 Fulton County’s recidivism rate almost defies comprehension. Here’s one telling snapshot: From the beginning of this year through March 14, APD’s APEX unit, which specializes in identifying and targeting violent crime trends throughout the city, arrested 27 convicted felons in possession of a firearm. Of those 27, 14 had been arrested 10 times or more. When Malcom Barnes, 27 was taken into custody on Jan. 2, he had already been arrested 15 times and tallied 12 felony convictions, APD records show. But 41-year-old Bill Grimes, arrested six days later, spent only three days in jail despite a rap sheet featuring 24 arrests and eight felony convictions. He’s out on $7,000 bond, as is Herman Wright, 59, arrested for the 33rd time on Feb. 19. Wright has four prior felony convictions. Last month, Shields took that message directly to an overflow crowd of concerned Buckhead residents at the Atlanta History Center. After taking some blame for failing to deploy a sufficient presence in the area, she turned her focus to repeat offenders and those she believes enable them. A crowd that was initially hostile proceeded to give the chief a standing ovation. Shields said she plans to continue speaking out on the repeat offenders, which she calls her top priority. “If these folks continue to stay engaged, and keep up the pressure, I do think change will come,” she said. But similar pushes have come up short in the past. Two days after Christmas in 2010, 38-year-old state trooper Chadwick LeCroy attempted to stop Gregory Favors, 30, because his car had a broken taillight. Favors sped away and crashed into a telephone pole, then fatally shot LeCroy in the neck as the trooper approached his vehicle. Later that day, Favors, a career criminal who had been in and out of jail and prison, was arrested for the 19th time. He had been arrested just 17 days earlier for trying to break into a car, but was released on a signature bond because he was brought to court too late and the officer who arrested him didn’t show. Public outcry followed, but major reforms didn’t. There were some minor changes, with minimal impact. A report by the Atlanta Police Foundation, using arrest data provided by the APEX unit, found that 481 repeat offenders — individuals with at least four felony convictions — accounted for more than 12,000 charges brought between April 2011 and December 2013. Of those repeat offenders, only 16 were sent to prison. Dave Wilkinson, the police foundation president and CEO, was tasked with convening The Atlanta Repeat Offender Commission, made up of top officials from law enforcement, the judiciary, government and the business community. The commission came up with a series of recommendations. Some were dead on arrival, such as the elimination of the “rocket docket,” created a decade ago to help move nonviolent felony cases through an overwhelmed court calendar, with magistrates, not judges, presiding. A compromise was reached, and it paid immediate dividends. 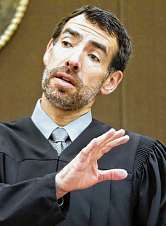 “The idea would be that all repeat offenders would go before the Superior Court judges,” Wilkinson said. The goal: To create a process that’s “offender-based, not offense-based,” he said. In 2015, 35 percent of repeat offenders were sentenced to some sort of confinement, up from 3 percent for the period from April 2011 through December 2013. That percentage rose to 37 percent in 2016. But the momentum wouldn’t last. “The group kind of disbanded,” Wilkinson said. The foundation’s newly created Atlanta Crime Lab is in the process of completing 2017 and 2018 reports and Wilkinson said it appears those numbers will be going back to where they were before 2015. The commission was recently re-activated, and over the next few months those reports will be released. They’ll include each judge’s record on repeat offenders — how many were sentenced to prison, placed on probation or released with time served. “No judge wants to see their name on this report that they’re soft on crime," said Wilkinson, quoting chief Fulton County Superior Court Judge Robert McBurney. A number of other challenges remain unresolved. Probation, the common denominator among many of the repeat offenders, requires the kind of supervision that Wilkinson said doesn’t currently exist. More probation officers are needed, he said, but currently the state has no plans to bolster their ranks. The biggest challenge, of course, will be overcoming the long-standing animus between the district attorney and the judges. The wild card, he said, is the person who’s been there the longest: D.A. Howard, now in his 22nd year in office. Howard has questioned the reliability of the foundation’s numbers. “We need an independent group to collect data for our county and our cities,” he said. “There’s not an independent data gathering system like there is in New York. You’ve got to have a place where you can extract accurate data. Active judges are limited in what they can say but retired Superior Court Judge Wendy Shoob told the AJC in February that Howard’s office is filled with inexperienced lawyers afraid to make workable deals. They instead push for tough sentences to please the boss, Shoob said, making it difficult to forge reasonable plea deals with defendants. The judges are caught in the middle, she said. “The judges have the most experience in the courtroom but the least amount of power,” she said. Howard hears that criticism but doesn’t accept it. Howard points to a 62 percent decrease in the violent crime rate since he took office in 1997. The issue, he said, is judges who hand down light sentences, providing little incentive for criminals to go straight. “That’s the probation office’s main complaint, that the sentences don’t offer deterrents,” he said. In an interview with the AJC, McBurney sidestepped the intramural politics that have infected the Fulton justice center for decades. He said judges could use more information, including a defendant’s juvenile record, which they currently aren’t allowed to view. “It’s important for a judge who is tasked with deciding the difficult question of whether the young man should go home with his parents to know what the young man has been involved within the preceding months,” he said. McBurney didn't close the door on Howard’s recent proposal that would prohibit magistrate judges from issuing bond for seven additional violent offenses including armed robbery, kidnapping and home invasion. He’s also suggested that recommendations for bond be handled by Superior Court judges. “I think it’s a creative approach to address some of the concerns the community has raised,” McBurney said. Atlanta Police Lt. Steve Zygai, who leads the APEX unit, said the repeat offender problem has been a constant in his 19 years on the force. “It’s a joke,” he said, adding that APEX officers are on a first-name basis with many of the criminals they apprehend. He bristles at complaints that the cops are part of the problem. Staff writers Bill Torpy, Bill Rankin and Raisa Habersham contributed to this article.